There is something special about getting into the mood for Christmas with a lovely festive book and the only thing that can beat that is a personalised festive story. 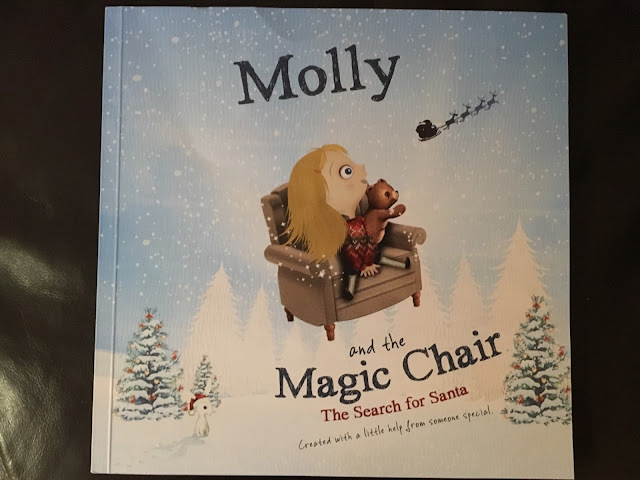 That is exactly why we very quickly agreed to review the personalised book "Molly and the Magic Chair - The search for Santa" by the company The Magic Chair. When we received the package in the post I could not believe how excited M was. Not only did she have a new book but it came wrapped in tissue paper so she had to go through the excitement of unwrapping her mail before she found out what it was. To personalise the book it is very simple. Just type in the name, choose the gender, skin colour, choose a hair style and colour, eye colour and glasses and clothing colour. You can then add a personalised message and a message to say it was made with the help of... I missed this part by mistake but it is optional and a message is still included even if you don't choose to personalise it. Once done you can view your book. Make any changes if necessary and purchase. The book itself has a lovely story. 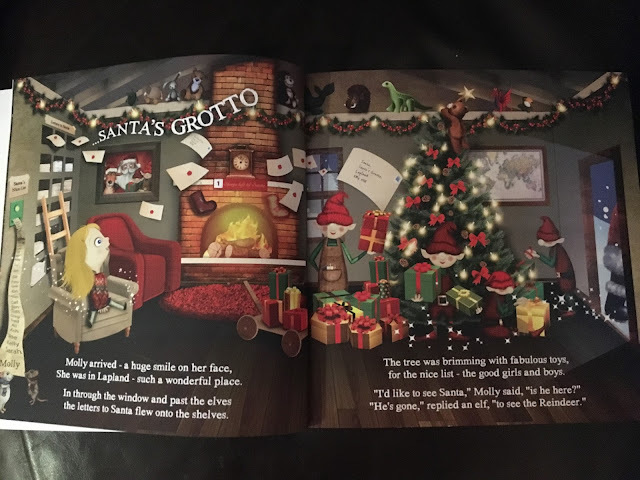 As a standalone story book it is wonderful and worthy of being on any kid's book shelf but add the personalisation and it really does make it a Christmas favourite. M (and I) loved the illustrations. She loved pointing out so many things and talking about each scene. She found it so funny to see Santa escaping the scene before we had a chance to catch him. Each page turn made her eyes light up and she was so excited. So much so she was found sitting on her "Santa chair" pretending she was off looking for him. This is the first Christmas when M is starting to understand what Christmas is and to see the excitement in her eyes is amazing. This book has added to that and she now looks to the sky to see if he is there. The story is lovely, and the rhythm and rhyme flows so well throughout the book. My only wish that you could have put details for more than one child - M was a little upset that Fraser's name was not on the nice list! That said it is only a minor niggle and not something that should put anyone off going and ordering this wonderful book. The Search for Santa can be purchased for £14.99 (well worth every penny!) from The Magic Chair's website. We were given a copy of The search for Santa in exchange for an honest review. All thoughts and opinions are of ours alone.